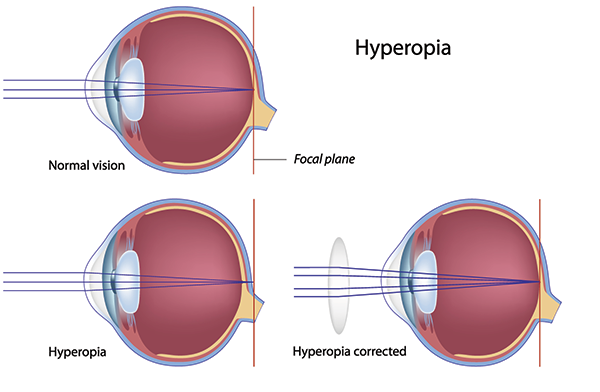 Farsightedness (hyperopia) is a common vision condition in which you can see distant objects more clearly, then near objects. The degree of your farsightedness determines your focusing ability. People with severe farsightedness may see near objects less clearly than distant objects, while those with mild farsightedness may be able to clearly see objects that are closer. Farsightedness can also contribute to a misalignment of the eyes because when the visual system tries to compensate for the condition it may effect the way the eye muscles work. Farsightedness usually is present at birth and tends to run in families. You can easily correct this condition with eyeglasses or contact lenses.